This chart covers the week commencing January 28th to February 3rd. There's a new entry at number one this week - which is a first for this chart! Twitch channel Method takes first place after racking up over 3.6 million hours watched this week. Method is a World of Warcraft raid guild set up by Scott "Sco" McMillan, and the channel seems to be hosting footage from them. It also explains why WoW has broken into the top 10 games of the week. 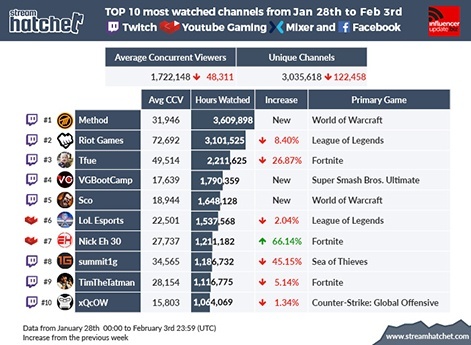 Riot Games' Twitch channel is in second place with an 8.4 per cent decrease in views. Fortnite star Tfue moves into third place despite a 26.8 per cent decrease in hours watched last week. Twitch channel VGBootCamp is a new entry in fourth place. The Super Smash Bros. focused channel racked up over 1.7 million hours watched last week. Fifth place goes to Sco, who was mentioned earlier on. The Method founder's own Twitch channel has amassed over 1.6 million views in the last week. The first YouTube Gaming channel appears in sixth place, which is LoL Esports. Despite a 2 per cent decrease in views, the League of Legends focused channel has moved up one place. Fellow YouTube channel Nick Eh 30 is in seventh place after a 66 per cent increase in hours watched. Fortnite streamer TimTheTatman is in ninth after racking up over 1.1 million hours watched last week. And in tenth place, we've got retired Overwatch pro xQc, who drummed up over a million hours watched playing CS:GO last week. 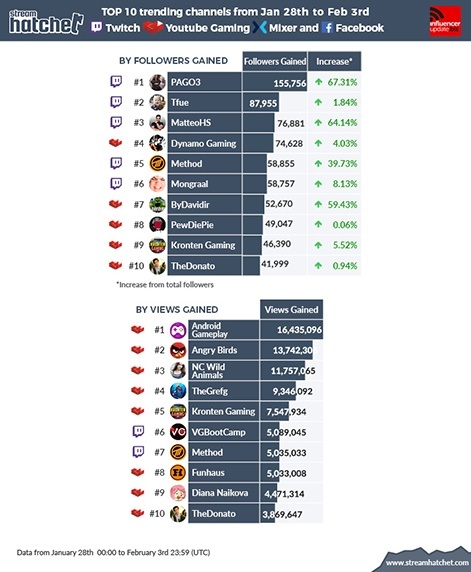 The trending by followers chart is headed by Twitch channel PAGO3. Mateusz 'PAGO' Pągowski is a retired Counter Strike pro player that is now streaming over on his own channel. He racked up over 115k followers last week. Tfue has been knocked down to second place but is still growing rapidly, bringing in over 87k new followers in the last week. Other entries include Twitch streamer MatteoHS who gained over 76k new follows, and YouTuber ByDavidir, who increased his subscriber count by 59 per cent. Also, PewDiePie has made an appearance in the trending by followers chart after reeling in another 49k subs to his YouTube channel in the last week. That's not unusual for Pewds, but it's enough to put him in the chart. Android Gameplay is topping the views chat this week. The mobile-centric YouTube channel has moved up to first place from second and has gained over 16.4 million views this week. The official Angry Birds YouTube channel is now in second place. Other entries include VGBootCamp who also made an appearance on the most-watched streamers chart, alongside YouTuber TheGrefg, and Venezuelan YouTuber TheDonato.